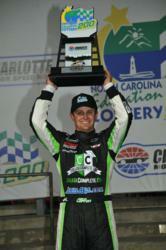 Lofton, driver of the CollegeComplete.com Chevrolet, leads in points in the NASCAR Camping World Truck Series. Lofton’s success coincides with the addition of Dr. Nick Sutton of CHAMP Consulting to the team. Dr. Sutton has been responsible for applying an innovative technology known as neurofeedback that Lofton credits with making him a better driver. Justin Lofton, driver of the No.6 CollegeComplete.com Chevrolet, has become the leader in the NASCAR Camping World Truck Series, with 200 points, 1 win, 3 top-5 finishes, and 5 top-10 finishes. Lofton’s success in 2012 coincides with the addition of Dr. Nick Sutton of CHAMP Consulting to the CollegeComplete.com team. As Performance Coach, Pit Coach, and JackMan to Lofton, Dr. Sutton has been responsible for applying an innovative technology known as neurofeedback that Lofton credits with making him a better driver. For College Complete, Dr. Sutton’s successful use of neurofeedback with Justin Lofton is a vivid illustration of the power of education. College Complete’s mission is to connect aspiring students with the best options for their education; It was thanks to websites like CollegeComplete.com that helped Dr. Nick to match his career and educational goals. he circle is now complete, as Dr. Sutton has been able to apply his Brain Master neurofeedback training and Avalon Light entrainment expertise to helping Justin Lofton reach the top of the NASCAR Camping World Truck Series. Dr. Sutton’s cutting-edge neurofeedback research with NASCAR athletes revealed that neurofeedback and individualized coaching are typically associated with an immediate and significant increase in performance. “The techniques that helped Justin Lofton improve his performance apply not only to all athletes but also people who care about performance, be they businesspeople, surgeons, or soldiers,” Dr. Sutton stated. “Neurofeedback lets us put everyone into a high-performance zone by training the brain to flow and focus.” To date, Dr. Sutton has worked with over 150 athletes and hopes to continue being a key part of Justin Lofton’s success in the NASCAR Camping World Truck Series. For his part, Justin Lofton credits Dr. Nick’s use of neurofeedback with a wide variety of positive outcomes: “I notice improvements in my driving, my business management skills, and my personal relationships.” Lofton recommends neurofeedback to anyone interested in performance improvement. Find out below how to contact College Complete and Dr. Nick Sutton at CHAMP Consulting for educational and performance enhancement. For more information visit CHAMPConsulting.com or youtube.com/champconsulting. CHAMP Consulting is a sports and business consulting group that focuses on increasing performance, marketability, and value in athletes and businesses of all kinds. Owner/CEO Dr. Nicholas L. Sutton has a unique background that includes placing over 150 different athletes into over 500 professional sports positions, while working with over 20 professional sports teams. The majority of Dr. Nick's work has been in the NASCAR series, but through experience, research, and extended education CHAMP Consulting has the ability to train and represent athletes from all major sports. CHAMP Consulting has a very strong network of businesses and resources that offers athletes and business a 1 Stop Shop for Increasing Performance and ultimately Increasing Profits! You can contact Dr. Nick at http://www.CHAMPconsulting.com or on Facebook to learn about his services, research, technology and partners (Lofton Racing, College Complete, New Mind Academy, New Mind Maps, Brain Master Technologies, Mad Industries, Sports Management World Wide). Partnered with hundreds of educational institutions and across all types of education goals, including traditional college degrees, trade and vocational certifications, and professional licensure, College Complete helps students assess all of the information that exists in the public domain, allowing them to understand and make sense of their educational opportunities. Their services are free and available to anyone. Whether you are interested in Art and Design, Business, Computers and Technology, Criminal Justice, Education, Healthcare and Medical, Science and Engineering, and much, much more; if you’re an Electrician, a Nurse, an Automotive Mechanic, a Teacher, a Police Officer, or you’re simply interested in learning Computer Programming, Networking, Web Development, or Graphic Design College Complete is available for you at no cost. You can reach them by filling out a form on their site or calling to speak with your personal Education Advocate at 877-543-2655. College Complete has an initiative to assist those in the US Armed Forces and their families and is able to assist in identifying schools that will not only provide the educational requirements of the soldier, veteran or family member but will do so in a cost effective manner.